I’m back from MagicCon and thought I’d share a few photos. 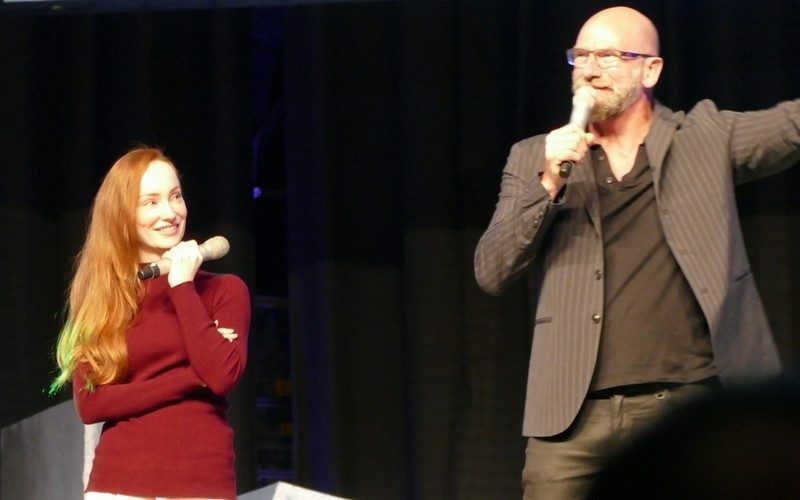 It’s only been my 3rd TV/Movie convention after a day at HobbitCon in 2014, after Graham McTavish started working on Outlander and of course RingCon 2015, which had a few Outlander guests. Sam Heughan for instance. I’ve been a lot less nervous this time, because even though I liked some of the shows besides Outlander, I wouldn’t consider myself a fan of the others. Some show I have never watched and thus neither knew the actors or the plot and was rather indifferent about it all. It was still entertaining and fun, even though someone like Liam McIntyre definitely was missing ;-) This first post will be photos from the whole weekend of some of the panels and autograph sessions. In chronological order. Other guests this weekend were some dwarves from the Hobbit: Jed Brophy, Dean O’Gorman and Adam Brown. I saw Dean in his panel and it was great fun as much as the one he did with Adam later on. I didn’t catch much of Zach McGowan’s (Black Sails) panels, but he seemed nice and entertaining. His presence and his voice really are pretty cool. There are a few photos of Emilie de Ravin (Once Upon a Time, LOST), but I only watched one of her panels, because I honestly didn’t think she was all that interesting. I loved LOST and her character there, but somehow she didn’t impress me much this weekend. The last guest featured in this photo selection is Tom Wlaschiha (Game of Thrones). I don’t watch that show either and only attended one of his panels, but that was fun. He is German, which made it extra special in a way. I didn’t see much of Steffan Rhodri, who plays a small part in the final Harry Potter movie nor of Keegan Connor Tracy (Once Upon A Time) except their part in the Opening / Closing Ceremony. I don’t think I’ve missed much there though. The biggest star of the weekend was Ian Somerhalder (Vampire Diaries, LOST) who will get his own post. Not because I was so impressed as I honestly wasn’t. I was rather underwhelmed. But I took quite a few photos during his panels. And there will be a 3rd post about the two Sherlock guests: Louise Brealey (Molly Hooper) and Andrew Scott (Moriarty), because they were amazing and all kinds of wonderful and deserve their own post.